What was it like working on this show? It was a very cool experience! I have worked in professional theatre before, but last time I was part of a large group of children in A Christmas Story at Royal MTC. This time, I’m the only non-adult. I was part of the workshops and development of Ellen Peterson’s adaptation, which meant that I did occasional readings for about a year. And when the show was confirmed, they asked me to play Margaret Dashwood and the non-speaking role of Sophia Grey. I was thrilled to accept, and my school was happy to accommodate the rehearsal and performance schedule. Rehearsal days were long, but it was fun to come to RMTC and be with actors and learn from them, and from director, Krista Jackson. Once we got into tech week, my schedule became a lot more hectic but I didn’t mind, because I was so excited to be in the theatre … and to wear such pretty costumes! What was it like playing a character from such a different time period? Unlike playing a character from present day, I had to get into a different mindset. Margaret (like me) is a 15-year old girl, but in that time period, being a teenager was very different. I did research on Regency England and the etiquette expected of a young girl. One of many differences was that Margaret would have completed formal schooling, and would be getting ready to be debuted on society (which means to be presented as an eligible young lady, ready to be married). Margaret’s future was a bit limited and kind of chosen for her. This made me especially grateful that I don’t have to get married yet, that I have so much choice in my future, and that I have many opportunities ahead of me. Funnily enough, although she wrote about the inevitably of marriage, Jane Austen herself never got married, which was unusual for woman of her time. Was it difficult to learn an accent? As a cast, we all got to individually work with Shannon Vickers, our dialect coach, and that was extremely helpful. I also have British grandparents, so I have a good ear for what that accent sounds like in daily use. It wasn’t challenging but it did take some practice. The more difficult part was projecting. I’m not wearing a microphone and I need the people in the balcony to hear me clearly so I have to project my voice. Shannon gave me great exercises and I practice them daily. I also drink a lot of herbal tea with honey to help my throat after a long week of talking loudly on stage! How has your experiences at MTYP prepared you for this role? Doing programs such as After School Leaders prepared me by teaching me about auditions, character work, and how to prepare for performance. It has also helped me form connections in the Winnipeg arts community. I definitely would not know as much about professional theatre as I do now, without my classes at MTYP. Also taking MTYP’s makeup class has come in useful as I do my own makeup and hair for the show! What advice would you give to MTYP students who are just starting out? Being in a professional show is a lot like being in a class or program: you work hard as a group on a tight timeline. All the things I learned at MTYP — about being on time, coming ready to learn, and listening carefully — I used during rehearsal and tech. Creating theatre and performing is something I love to do and I definitely wouldn’t have that passion and drive had it not been for MTYP. My advice to fellow students and young artists is to learn as much as you can and take classes! MTYP is a creative outlet for me and has helped me become the actor I am today. 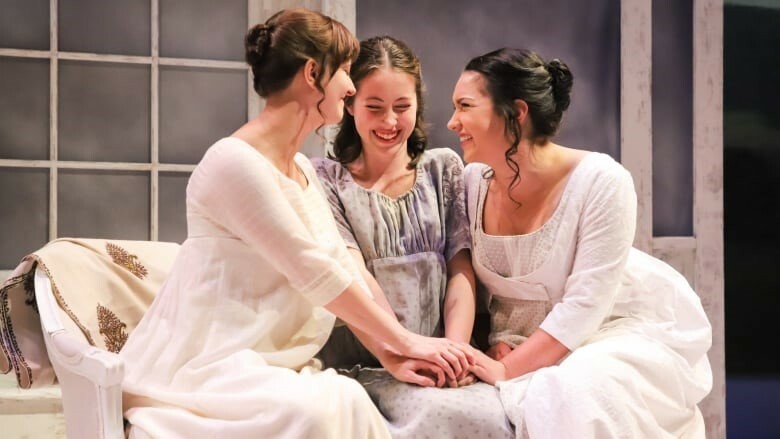 *Sense and Sensibility runs until Nov 10 at Royal Manitoba Theatre Centre, Mainstage.